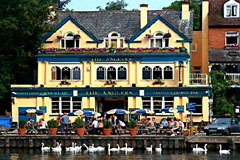 This unique pub on the Thames towpath at Walton offers an outside patio, a spacious ground floor bar with a log fire roaring in the winter, and an upstairs restaurant with the most magnificent river views. Enjoy panoramic vistas of river life: swans, skiffs, Olympic rowers and canoeists, boat people and bird life drifting past. The food is absolutely real – fresh fish, charcoal grilled meats, scrumptious salads and wonderful comfort food prepared by our chefs. Great quality wines, lagers and traditional beers complete the perfect scene. Food served every day noon-9:30pm (Sun noon-7:00 pm) summer, winter every day noon-4:00pm and 6:00-9:30pm (Sun noon–7:00). Bar open pub hours. All major credit cards accepted (not Amex/Diners). 10% optional service charge for parties of 6 or more.